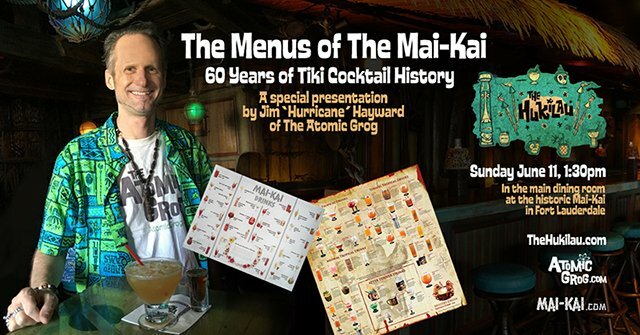 More than 100 Tiki explorers took a trip through time, from 1956 to the present day, via the lavish tropical drink menus of the world famous Mai-Kai restaurant in Fort Lauderdale during The Hukilau on Sunday, June 11. 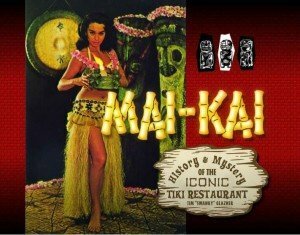 “The Menus of The Mai-Kai: 60 Years of Tiki Cocktail History” was an interactive slideshow presentation that examined vintage menus and traced the chronology of the legendary cocktails at this acclaimed mid-century landmark. Rare “lost cocktails” from the early menus were served as journalist/mixologist Jim “Hurricane” Hayward of The Atomic Grog blog presented a rum-fueled history lesson on the evolution of dozens of influential cocktails still served today at The Mai-Kai using their original secret recipes. This special event in The Mai-Kai’s main dining room took place at 1:30 p.m. as part of The Hukilau’s final day of festivities. The party started at noon in The Molokai bar with live surf music by Skinny Jimmy Stingray and three special “lost cocktails” from The Mai-Kai’s 1956 menu. The Hukilau’s villagers enjoyed drinks and classic pu-pu appetizers all day while Skinny Jimmy performed several high-energy sets, keeping the dance floor hopping. 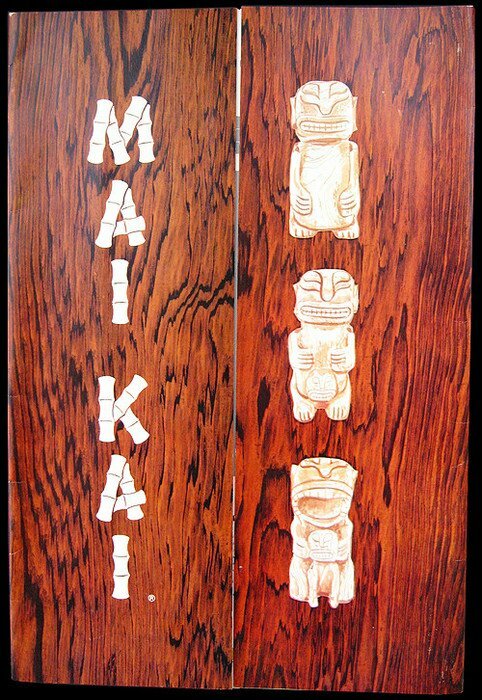 This rare daytime event at The Mai-Kai was exclusive for attendees of The Hukilau. The Hukilau: June 7-11, 2017, at the Hyatt Regency Pier 66 and The Mai-Kai restaurant in Fort Lauderdale. Attendees learned about the history of the cocktails in Hurricane Hayward’s symposium and got a chance to enjoy the historic Mai-Kai (named to the National Register of Historic Places in 2014) in a relaxed and laid-back final day of The Hukilau. 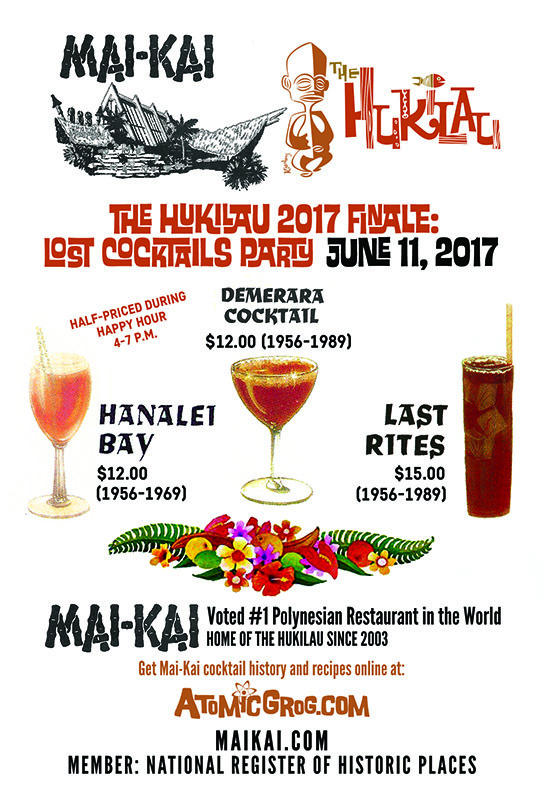 The Hukilau, now in its 16th year, is the East Coast’s largest and most authentic Tiki and Polynesian Pop event. It featured five days of live music and entertainment, educational symposiums, exclusive parties in unique settings, rum and cocktail tastings, dozens of vendors selling retro-themed art and merchandise, plus pop-up bars featuring some of the world’s top Tiki mixologists. Besides The Mai-Kai, events took place at the host hotel, the Hyatt Regency Pier 66, as well as The Wreck Bar at the B Ocean Resort. Other symposiums included “The Mai-Kai’s Untold Stories” with Tim “Swanky” Glazner on Friday and “Nautical Tiki” with Mike Skinner on Saturday at Pier 66. Swanky’s presentation included a number of Mai-Kai legends. This entry was posted in 2017, Cocktails, Cocktails, Culture, Events, Events, Events, Events, History, History, Hukilau, Mai-Kai, Music, Restaurants, South Florida and tagged cocktail menu, cocktails, Hukilau, Mai-Kai, Mai-Kai: History and Mystery of The Iconic Tiki Restaurant, menu, Molokai bar, Skinny Jimmy Stingray, Tiki history. Bookmark the permalink.